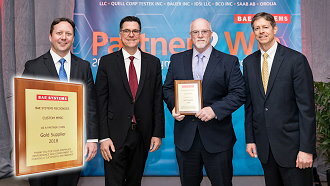 Thursday, April 11, 2019 - Chelmsford, MA - We're honored to be the only semiconductor supplier to receive BAE Systems' distinguished GOLD Supplier award for 2018. As part of their "Partner 2 Win" Supplier Program BAE Systems conducts a comprehensive annual review of all their key suppliers and brings the top performing suppliers together for an evening of appreciation and to acknowledge their outstanding support over the previous year. "We are both honored and proud to have been selected to receive this prestigious award from BAE Systems. This customer acknowledgement reaffirms Custom MMICs commitment to providing the best products and services possible to our valued customers and partners now and for the future," said Dave Folding. Since 2006 Custom MMIC has been recognized as a top-tier quality supplier of the best high-performance RF and Microwave MMIC products earning us numerous industry and top supplier excellence awards like the GOLD Supplier award from BAE. We continue to exceed our customers' expectations and strive to challenge the boundaries of RF and Microwave engineering design. From next-generation long range military radar systems, to advanced aerospace and satellite communications, microwave signal chains are being pushed to new limits - and no one understands this more than Custom MMIC. Founded in 2006 as a fabless RF and microwave MMIC designer, we've been entrusted by government and defense industry OEMs with their biggest microwave circuit challenges.